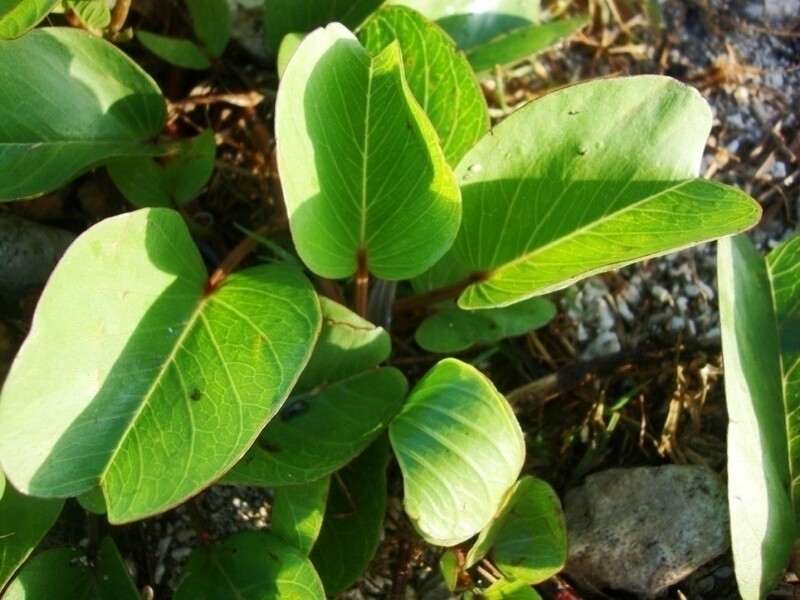 Ipomoea pes-caprae, called pōhuehue, is a cosmopolitan species found in sandy coastal areas throughout the Hawaiian archipelago. It is a strong vine, the smooth, broad leaves notched at the top; the flowers pink, bell-shaped; a white-flowered form is rare in Hawaiʻi; the fruits small, dry, round, four-seeded. One hits the sea with this vine to make a rough sea for surfing, or to kill an enemy who was in the sea. It was first documented on Kure in 1979 and then was absent from botanical surveys until 2001. By 2006, the population had 2 individuals and possibly only then began to recover from the rat eradication in 1993. Today, it is less common than its congener, I. indica, and there are still only two locations where this species has been able to establish–the West Landfill and near the USCG Monument. Prior to the Winter 2014-15, the West Landfill was the only site this plant could be found. During the Winter 2014-15 season, pōhuehue was outplanted in an old septic tank located next to the USCG Monument where the LORAN tower and building once stood. Since then sand, scrap iron, and mucky seep water have been added to the pit periodically and the plant has successfully established itself. In 2016, there were strands reaching upwards of 10 meters as well as some flowering. Pōhuehue is best outplanted in areas where all the water collects at a low point on the land or where the freshwater table is close to the surface such as at the West Landfill. From 2006-2009 seeds and cuttings were transported from Midway to restore this plant on Kure. The success rate has been low possibly due to an iron deficiency. By showing plant experts what the plant looked like when it dies, they were able to decipher that pōhuehue needs iron. There arenʻt as many iron sources on Kure as there are on Midway, albeit for a few areas such as the West Landfill which is the old USCG scrape metal dump.